One of Antofagasta‘s main claims to fame is the enormous El Mauro tailings dam above the small town of Caimanes in northern Chile, a town of some 1600 people (or 2000 if you include the mining company’s contract workers) which would be inundated in about five minutes if the 300-metre tall dam, restraining 2700 million tonnes of liquid toxic wastes, were to collapse. The wastes – ‘tailings’ – are from its Pelambres copper mine nearby. This year, for the first time, London Mining Network – with the help of our friends at War on Want and Movimiento Jaguar Despierto – brought two of our friends from Chile to attend the Antofagasta PLC AGM, held at Church House, Westminster, on Wednesday 18 May. Patricio Bustamante is an archeo-astronomist and one of the most important researchers on the Inca occupation in Collasuyu (Chena pucara – or eventually Huaca – in Chile). About a decade ago, he denounced the loss of important archaeological pieces that occurred with the construction of the Pelambres mining project. Since then he has been working with the Caimanes community to denounce human rights violations such as threats to life, security, lack of water and corruption. Patricio has given talks at several Universities around the world denouncing the impacts of mining projects in Chile. Marcela Mella Ortiz is a teacher, mother of two daughters, and Chairwoman of the Citizen Coordination “NO Alto Maipo.” Alto Maipo is a hydroelectric project being constructed near the Chilean capital, Santiago, to provide electricity to the Pelambres mine. Marcela has been part of the organisation since its founding in 2007 and is a member of the Cajon del Maipo community, which she has represented in resistance to the Alto Maipo project. She has organised and participated in marches and other activities related to social mobilisation against Alto Maipo and Minera Los Pelambres in Santiago and in the northern regions. Last year’s Antofagasta AGM was dominated by talk of protests and lawsuits. This year, the company’s Chairman, Jean-Paul Luksic, began the AGM by trying – among other things – to tell us that all was now well, that everything had been resolved. He said that the company had made good progress in improving its sustainability. It recycled up to 72% of water in its operations in 2015, with the rest evaporating or remaining in tailings facilities (he said nothing about the danger posed for many years to come by toxic wastes in tailings ponds…). The company is a leading user of sea water. It needs sufficient water to operate without compromising availability of water for local communities. He said that at the town of Caimanes, below the Mauro tailings dam, which stores wastes from the Pelambres copper mine north of Santiago, 60% owned subsidiary Minera Los Pelambres (MLP) had engaged in a formal, transparent, open consultation process designed to allow it to understand the community’s concerns and share information about its activities. 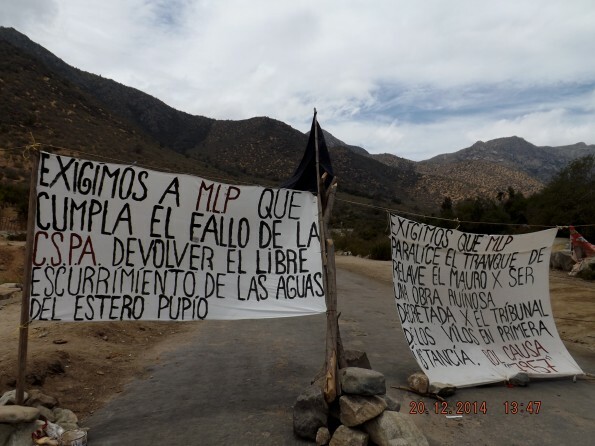 Less than two weeks ago MLP had come to an agreement with the people of Caimanes which addresses the concerns of the judicial decision which had called on the company to provide water to the community. Under the agreement, MLP will provide water, community development projects and compensation. The company is keen to limit its impacts, increase energy efficiency, and diversify its energy supply to include more renewables. By 2019 it is expecting that 80% of its supply will be from renewables. He said that Antofagasta takes its responsibility to communities and the environment very seriously. It will continue to work with local stakeholders to develop a common vision. He said that he wanted to restate the company’s commitment to safety after the loss of two workers in 2015. The safety of communities would always come first and the company would work hard to achieve its goal of zero fatalities. He thanked all the company’s employees and contractors. He also said a fair amount about the copper market and projections for future commodities prices, but I suspect that readers of this website are less interested in such matters than in the community and environmental impacts that are our concern, so I have not included these. The company does not appear to have posted Luksic’s address on its website, but you can find the company’s Annual Report and Sustainability Report for 2015, along with the notice of the AGM, here. Jean-Paul Luksic then said that questions would be taken after the end of the formal part of the meeting. This is really poor practice in my view: until shareholders have had a chance to question the board about the company’s performance over the past year, how can they cast their votes in a sufficiently informed manner? One shareholder clearly agreed, and objected. He said he had recently become a shareholder and was surprised to see that Luksic’s fellow directors did not want any shares in the company. He said they should put some of their money into the company like he had done. Jean-Paul Luksic laughed, saying that this was not for lack of confidence in the company. It was simply easier for the directors not to have any shares. Dealing with shares in a FTSE 100 company in the UK can be a risky business, he said. So the best solution is not to be involved in trading the shares. The questioner pointed out that a lot of FTSE 100 companies have non-executive directors with shares in the company. He said that the directors of Antofagasta knew a lot more about the company than he did, and it seemed odd that they did not want shares in it. Jean-Paul Luksic replied that he had no hesitation as to the professionalism of the directors and believed that they were doing their duty to the shareholders. The questioner asked whether there was a law in Chile that prevents non-executive directors from holding shares in the company. Jean-Paul Luksic replied that there was not. The resolutions were then all proposed anyway, before further questions were asked, and only after the poll had been called for did the Chairman open the floor to general questions. One shareholder asked about share buy-backs. Had the company bought any shares in the last year? What was the policy of the board given the share price? The response was that the company had never bought back shares. The board had discussed this a few times. For the particular structure of the company, Jean-Paul Luksic said it was not very fitting, as the controlling shareholder (his own family) has up to 64% of the shares, and further dilution of the minority shares would not be good. Well, it was he who said it. Another shareholder said he was interested in legal issues at the Pelambres mine. He said there were three pending legal issues, each of which could have an impact on mining operations. He said he needed reassurance that the company had the necessary legal team to handle any legal issues arising. Jean-Paul Luksic said that the company had been facing this issue for some time. It had been sued by part of the community around the mine. Now the board felt that the company was reaching a new level of understanding with the communities. It had taken some time to have a better understanding. This time round, the board felt it had a very good, very formal, very transparent mechanism in which the company had been approaching and discussing with the communities. There had been a high level of participation by people in the communities. This had stemmed from one of the court cases, which had said that Minera Los Pelambres had to either knock down the tailings dam or make improvements to the existing tailings dams and provide some community works. The company had been working very hard under that ruling by the court to work with the communities and improve safety, community development and water quality and availability. Francisco Veloso, Chairman of the Board of Minera Los Pelambres, added that the company had reached agreement with the community of Caimanes, who were the plaintiffs. He said that this is a formal agreement and was finalised after a long process of deep participation with a transparent process carried out with the help of the Chilean chapter of Transparency International. The process included people who were against the company as well as those in favour. Most important, a high percentage of the community voted in favour of the agreement – more than 80% of the population of the whole valley, and 77% of the families. The agreement contains three main pillars: safety, water, and a community development fund that will allow the community to improve its social capabilities. This will end the three cases mentioned and will reduce the risks of new litigation because of the huge legitimacy of the consultation and agreement process with the community. Patricio Bustamante, speaking with the help of interpreter Seb Ordonez, said that he had advised the community of Caimanes for twelve years. He said that in Chile during 2014-16 there had been many cases of corruption, in which many politicians had received money from big companies, some of which belonged to the Luksic brothers, one of which was Antofagasta Minerals. In Chile it is illegal for foreign companies to finance political campaigns and politicians in office. Government Minister Jorge Insunza had been in the government for only 27 days before having to resign because he had been receiving funding from Antofagasta Minerals and Antofagasta plc, and in Chile this is seen as ethically incorrect. Antofagasta plc is a UK company. It is subject to the UK Bribery Act. Minera Los Pelambres in Chile, and therefore its owner Antofagasta plc, has been financing political campaigns in Chile. Patricio said that he had taken cases to the Supreme Court and the Fiscalia Nacional for investigation of possible corruption and possible criminal association. Patricio asked William Hayes, Chairman of the company’s Audit and Risk Committee, to explain the Antofagasta plc ethical guidelines regarding political donations, as he had found no mention of political campaigning in the company’s financial statements. William Hayes replied that Antofagasta has an ethics policy which is disseminated to all employees, and there is an ethics committee which reviews any matters of doubt. He said he was familiar with the UK Bribery Act and the US Foreign Corrupt Practices Act. The company has a crime prevention officer reporting to the Audit Committee, with eleven internal auditors who report to the Audit and Risk Committee. The Committee has a risk management function, identify and mitigate risks. It is made up of three independent directors with no connection to other directors. The Antofagasta group did not make any political contributions in 2015. Some were made in 2014 and were duly reported in the company’s Annual Report. He said there was nothing there which counts as illegal financing of politicians. Patricio said that it is illegal for a foreign company to finance politicians in Chile. William Hayes replied that Minera Los Pelambres, the Antofagasta subsidiary which made the donations, is a Chilean company, not a foreign company. Patricio said that, with respect to transparency, Ms Vivianne Blanlot, one of the directors of Antofagasta plc, is also President of the Transparency Council in Chile. Any petition for release of information has to be approved by Ms Blanlot. He said that this is clearly an issue of conflict of interest. Jean-Paul Luksic replied that there is no conflict of interest. Every time the company had been asked for information, the information had been given. In the unlikely event that more information is required, the person seeking the information could use the legal system in Chile, and the last resort would be the Transparency Council, but Jean-Paul Luksic could not see how that would affect the professional behaviour of Mrs Blanlot. Vivianne Blanlot said she would like to clarify that she is indeed a member of the Transparency Council, which has oversight over public information but not over private companies. Occasionally people ask for information from the public sector which involves private companies, and in this case any member of the Council with any connection with that company has to refrain from discussion of the issue. The Council follows closely what the law requires. Patricio said that he disagreed with what had been said. He said that he had evidence to back up everything he was saying and that he could make that information available to interested shareholders. He said that he had been soliciting information from the company for years, and had spoken to the management of Minera Los Pelambres, but had received no information. Jean-Paul Luksic said that he understood that the company had given all the information requested through legal tribunals in Chile. Patricio then spoke about the recent agreement with the community of Caimanes. He said that everyone who signed the agreement received the equivalent of £28,000. He said he had video footage showing a representatives of the mine offering this amount to community members. Francisco Veloso from Minera Los Pelambres said that the company feels very proud of the agreement and had evidence of the process – a record of more than fifteen meetings – and had put no restrictions on Patricio’s activity around the meetings. This, he said, was transparency. Fifteen assemblies had been held. The agreement has three pillars: safety – committing facilities to ensure there would be no harm to the village if something happened with the dam; building facilities to provide water to the community as requested by the court; and creation of a development fund. There are two parts to the fund. One is a family fund which is for families, not individuals, to allow them to apply for health, housing, education or entrepreneurial development. Then there is a community fund, where the community will decide what activities to fund. Mr Veloso said he felt very proud of this agreement, both because of the result of the process and because of the process itself. He said he felt very proud that Patricio was able to record all the assemblies that had been held. Patricio said that he disagreed, as the evidence showed something different. He said that there is a video on You Tube showing security guards impeding community members from entering assemblies, as well as recordings of the lawyers who used to work with the community and now work with mine talking about the agreements. The guarantor of the process, the Chilean chapter of Transparency International, receives money from Antofagasta, which is at a minimum a conflict of interest, and this does not appear in William Hayes’ reports. Families who do not sign the agreement do not receive any money. They do not have any rights unless they sign. What is offered for security is a wall four metres high, which hypothetically is to stop 2700 million tonnes of toxic wastes, travelling at 100 kilometres per hour, in the case of dam failure. The 2014 dam burst at Mount Polley in Canada and last year’s dam collapse in Brazil demonstrated the danger. The Samarco dam in Brazil had been built by BHP Billiton with the latest technology and it nonetheless burst. The Supreme Court in Chile has declared that the Mauro dam is a danger to human life. The compensation amount of £28000 per signatory involves renunciation of signatories’ legal right to defend themselves in any eventuality. This agreement is another evidence of corruption, where the company is able to do as it wishes because of its connections with the state. With regard to being proud of the process, this actually brings shame to the company. Jean-Paul Luksic said that it was true that those who do not sign the agreement will not receive £28000, but they will benefit from other community investment. He said that it was also worth emphasising that over 80% of the people accepted the agreement. The community and the company are tired of having disagreements for so many years. Regarding tailings dam, tailings dams in Chile have to comply with rigorous seismic regulations. The company complies with the highest operating standards and the proof of this is that there had been a major earthquake and nothing had happened to the Mauro tailings dam. The company was proud of this. Marcela Mella Ortiz, speaking with the help of interpreter Seb Ordonez, introduced herself as the president and spokesperson of the Citizen’s Co-ordination No to Alto Maipo, which has been opposing the Alto Maipo hydroelectric project, owned by AESCORP and Antofagasta Minerals. This project is being built in the Maipo river basin, which provides drinking water to the seven million inhabitants of Chile’s capital city, Santiago, in order to provide energy for the Pelambres mine. Antofagasta owns 40% of the venture. Marcela said that he first question was to ask if the shareholders were aware of the ruling last week by the San Miguel Appeals Tribunal, which found that the construction of the Alto Maipo project had contaminated part of the water sources of the Cajon del Maipo with heavy metals. The Tribunal had ordered the highest environmental authority in Chile, the Chilean Environmental Superintendence, and the Alto Maipo project administration, to investigate and resolve the problem in the next thirty days If this were not done, the construction of the project must be halted indefinitely. Marcela said that her second question was therefore to ask what steps shareholders were going to take to resolve the problem of contamination of water sources by heavy metals in the construction of the project, taking into account that this contamination could cause grave illnesses like cancer and genetic malformations. Jean-Paul Luksic said that Marcela was right that Antofagasta is involved in the Alto Maipo project through Minera Los Pelambres (MLP), of which Antofagasta owns 60%; and MLP owns 40% of the project. The project does not dam the river. It will produce renewable energy. It has already been approved by the authorities before Antofagasta got involved. MLP was part of a tender to become partners with AES, which is the controller of the project. The project was being pursued with the highest standards of care for the community and the water. Jean-Paul Luksic said he was not aware of the contamination issue at the tribunal but was sure that this would be taken to the next stage of the court process as the dispute is not finished. He said it was hard to comment on a legal procedure which has another stage to come. Marcela said that the ruling could be appealed and subsequently taken to the Supreme Court, and that her understanding was that Alto Maipo had not yet decided whether or not to appeal. With regard to joining the project, the amount of lobbying and peddling of influence had been widely documented before Antofagasta bought into the project, and Marcela knew that Jean-Paul Luksic had met the groups opposing the project and was told about the risks but took it on anyway. Jean-Paul Luksic replied that he had indeed met with ‘a minority group’ opposing Alto Maipo and still thought that the decision taken by the company was correct. He said there was no reason to believe there was anything wrong with the permitting process, and it had already been permitted before Antofagasta got involved. He said it was a great project for Chile and for Santiago. It is being developed by one of the world’s most expert companies, AES Gener. They operate in the same valley already. They are using the most modern technologies, so there is no reason to believe that water quality would be affected. Antofagasta hires the best possible experts on water to get their views. This project was eventually financed through a subsidiary of the World Bank, and therefore went through another stage of independent checking of its environmental viability. The project is now fully by the IFC [International Finance Corporation, the private sector funding arm of the World Bank]. Marcela pointed out that her organisation is not a minority organisation. She said that it was clear that the project is threatening the human rights of communities which have suffered impacts such as being surrounded by safety walls. Antofagasta controls 40% of the project and has a responsibility to communities affected by it. This has happened under the auspices of the state. It has impacts on climate change through its effects on the Maipo and other rivers in the area. A Chilean parliamentary investigation into the way this project was approved showed irregularities and lobbying, and the investigation’s report is publicly available. Jean-Paul Luksic said that he could only reiterate the view that this was a minority group opposing the project and the World Bank and IFC gave their approval, though they had also asked for extra information. Antofagasta is indeed part of this project through MLP and takes its responsibilities very seriously. It is participating in addressing all the issues that come up during construction. I then congratulated the directors of Antofagasta PLC for not having shares in the company. I pointed out that the Brazilian Government was suing BHP Billiton and Vale for over $4 billion for the Samarco tailings dam collapse and that there were efforts to sue the companies for something over $44 billion. Noting that it was not possible to guarantee that a tailings dam would never fail, I asked whether the Mauro dam was insured, and if so, with whom, and if not, what would be the liability of shareholders in the event of a collapse. The company’s response was provided by – I think – Ivan Arriagada, CEO of Antofagasta Minerals (the Chilean arm of Antofagasta PLC). He said that when the Samarco dam collapse took place Antofagasta did a full review of the operation of the tailings dam at Pelambres. It brought independent people to examine it and confirmed that the operation of the dam fulfilled all the requirements, confirming the quality of construction and the condition of the dam. There were differences from the Samarco dam: the construction methods are different and water management is different, ensuring quick release of water should it be necessary. The company closely monitors what is happening in the dam. The company has insurance and has the review of the dam that the insurance companies involved have made. There is an external review each quarter. The company is operating the dam according to its design features and does not share the concerns which have been expressed. Shareholder Monica Redmond said that she had studied a fair amount of geology. She asked what the company did to inspect the internal structure of the dam. She said that, as it was already known that the dam might be ‘dodgy’, the company could be fined even more than BHP Billiton in Brazil. She said that if the ground went the wrong way in the next earthquake, the company would lose the dam and the safety walls. Ivan Arriagada confirmed that the company had inspected the internal structure of the dam. He said that the design of the dam would tolerate an earthquake of 9.5 on the Richter scale, which is very improbable. Movement of high intensity had been simulated and the company had measured how the dam would behave. It had put in walls to cope with this wholly theoretical event. Emergency response mechanisms had been developed to deal with this kind of emergency. Patricio noted that with regard to seismic security, it was important that the meeting should not receive false information. He said that the Chilean Supreme Court, the highest court in Chile, whose decisions cannot be appealed, had decided that El Mauro was constructed to withstand a direct earthquake of 7.5 on the Richter scale and 8.3 at 80km, which is what happened in 2005; but examining all the antecedents it had said that the dam must be able to withstand an earthquake of magnitude 9.5 in accordance with international norms and standards. It had said that the dam was poorly constructed to withstand the maximum earthquake in Chile and constituted a danger to human life. He reiterated that the Supreme Court had determined that the Mauro tailings dam was a danger to human life. Francisco Veloso said that he wished to reiterate what Ivan had already said, that the dam was constructed for an earthquake of 8.3 plus an additional factor which reached the 9.5 level which Patricio had mentioned. The Supreme Court had requested the company to improve its monitoring of the dam and to elaborate an emergency plan. It had had an emergency plan but after the court decision it consulted the community about a new emergency plan and decided with the community what would be the main constituents of the new plan. There was strict oversight by the Chilean authorities involving the water and health authorities as well as the mining authorities. Watch a short video message from Marcela about the Alto Maipo struggle. Watch a one-hour video, Stolen Water, about the struggle of the people of Caimanes to stop the tailings dam being built and then, when it was built, to get justice from the company. For all our articles on Antofagasta, see http://londonminingnetwork.org/?s=Antofagasta.